Tim Gaden summarizes ten tools with which Mac users can do GTD. 52 Reviews has a handy reference page on popular GTD implementation tools. Although, personally, it looks incomplete to me without Kinkless GTD on there :) . Herewith for your approval, a few handy tricks I've been discovering for getting the most out of the peerless Omni Outliner Pro/kGTD combo. And don't forget -- as noted last week -- through the end of this month, when you buy any OmniOutliner product from the OmniGroup site, you can use the checkout code 43FOLDERS to get 25% off your order. Disco! In last Thursday's podcast, "Fallow Projects and the Bread Crumb Trail", I mentioned how I like to move stalled or clinically-dead projects off my immediate radar screen; it makes it so much easier to focus when only actionable stuff is being tracked actively. Anyhow, lots of people asked for more details on that, so here you go. In kGTD, you want to create a holding pen for these sick animals by generating a new top-level Project and calling it, say, "Fallow Projects #" (or whatever you prefer, but do include the "pound") then scooting all those moribund projects thereunder. Cool enough, but, here comes the nifty. Erik Schmidt has a useful post on how he's using OmniOutliner Pro and Kinkless GTD in law school. His explanation of kGTD is succinct and nicely captures the economy of using a simple system to track projects and tasks. When you see a requested action in an email, don't do it immediately. It might be one of the least important things for you to do that day. Instead, immediately identify what the action is and put the email in a task folder. 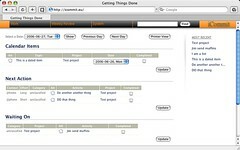 Change the title so that it states what you need to do, and put a due date on it and a priority level. You can do that in 15 or 20 seconds. Then you move right on to the next email. Now you'll get through your to-do email remarkably fast. Drag all of your other emails into a process folder, so you now have an empty inbox, which is a really nice feeling. The next thing you do is go to your task list and ask, "What are the most important things I need to do today?" That's the stuff that would keep you from going home at the end of the day.